Water infrastructure is invisible, but when it fails, its impact becomes all too obvious. 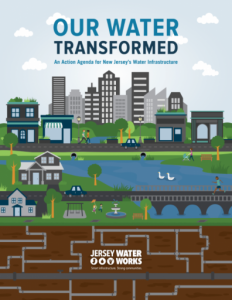 This report provides consensus-based solutions developed by the Jersey Water Works collaborative to ensure the system upgrades needed to support healthy, sustainable communities. Robust asset management to enable water utilities to deliver the optimum level of service with the most community benefits at the lowest lifecycle cost. Educated stakeholders so that ratepayers and rate setters, consumers and policymakers can understand the value of investing in water infrastructure and the peril of deferring maintenance. Government funding initiatives to provide loans and grants to help implement asset management and upgrade systems. National experts Howard Neukrug and Diana Lind of the University of Pennsylvania argue that we must rethink how we manage, fund, design and rebuild our water systems. Their essay, which forms the middle section of this report, lays out a broad set of options that can move communities to a sustainable water future, such as realizing the enormous cost savings from repairing leaks that forfeit millions of gallons. Included are successful New Jersey examples such as recovering methane energy from wastewater and using rain gardens to mitigate flooding. 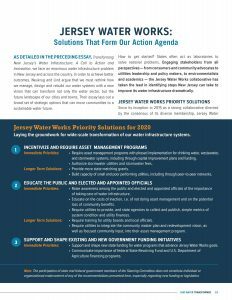 Jersey Water Works has developed this infographic to help communicate the priority solutions identified in the report. Feel free to download and share! Click here to open and download.